Two weeks ago I taught an underwater photography class at a dive center in Las Vegas. As the day wrapped up and I was starting to pack my gear and head for the airport to return home, one of my students approached me and said, “I learned a lot about how to make photographs today. I truly love animals, and what I would like to know now is what do I need to learn to get really good at photographing animals underwater?” Now that is a great question. I thought for a moment, and replied by saying, “I would love to talk with you about your question and give it the time that it deserves.” But I needed to get to the airport for my flight so I promised to get back to her with my answer. That is exactly what I am going to do here: share some things that have helped me photograph various creatures that inhabit the world’s oceans. The camera might make you feel brave, but don’t ever take large marine creatures for granted. Those “Three P’s” are definitely part of my experience. After diving and photographing marine wildlife for more than 40 years, I still love being in the ocean, learning about marine wildlife, and trying to capture what I see with a camera as much as I ever have. In the endeavor to photograph marine wildlife, all of us regularly deal with the elements, unpredictable animals, the inconveniences of travel, long hours, and the challenge of taking electronic equipment into harsh environments. I simply don’t see how anyone could be a successful wildlife photographer of any kind without being extremely passionate about what they do. One of the luckiest things that ever happened to me was having the chance to work with some pioneers in underwater photography in the early days of my career. Those people include Stan Waterman, Chuck Nicklin, Jack McKenney and Ron and Valerie Taylor, among others. And I became very close friends and diving buddies with current-day IMAX film producer Howard Hall. All of these people brought different talents to the table, but two traits that they all exhibited were persistence and patience. I learned early on that when it comes to successfully photographing wildlife, you absolutely have to keep on keeping on. Learning photographic fundamentals is every bit as important as minding the “Three P’s.” To enjoy consistent success in this game and to maximize your opportunities, you really need to understand how your camera system works. And these days you need to be computer-savvy so you can manipulate images with post-capture software, store images in a way that you can quickly retrieve them and know that your work is successfully backed up. As the saying goes, there are two kinds of hard drives; those that have died and those that are about to. There are no excuses for not having multiple backup copies of all your images, stored in different physical locations. Let me go back to the importance of truly understanding how your camera system functions. In my basic underwater photography classes I place a lot of emphasis on being sure that students learn how camera systems work so they can properly expose their subjects. I do this because experience has taught me that consistently acquiring good exposures is a big hurdle for most beginning underwater photographers. On the other hand, properly exposing frame after frame is second nature for highly regarded shooters, and this skill allows them to concentrate on their composition and the other things they need to do to create their images. In the early days of my career I wasted too many exceptional opportunities because I didn’t understand how to adjust my camera or set the power on my strobes. One time involved an opportunity to photograph a group of California sea lion yearlings and pups. The animals were extremely playful and obviously interested in me. But the action took place at a frenetic pace, and I found myself fumbling with my gear and guessing about my camera system settings. As a result, my exposures were horribly inconsistent and mostly way off the mark. The results convinced me I needed to put in some time and effort to learn some very learnable things. Once I did, my photography took a big leap forward. And I have seen a lot of my students go through the same process and enjoy the same increase in skill, confidence and results once they put in the effort to be sure they truly understand the fundamentals. Another important yet often overlooked aspect of enjoying success in the field is doing the right things to keep photographic equipment in good working order. I’m talking mundane but important stuff like maintaining O-ring seals, assembling and cleaning photographic equipment, being sure to test systems before dives, and rinsing, properly stowing and packing equipment after dives. This does not require any exceptional knowledge. But it does require a commitment, discipline and your undivided attention. It’s all too easy to want to skip a step or two when you are tired, or to assume that your gear will work today because it worked yesterday. But skipping steps and making assumptions is a guaranteed path to equipment disasters. It also means losing potentially productive time and the opportunities that time might have brought. It’s funny how easy it is to think that “you can make the same dive tomorrow,” but almost all of the images in my library that I think of as my signature images come from those so-called once-in-a-lifetime opportunities. Getting in the water with gear that works is the only way you’ll get a shot at taking that stunning photo. Of course, being wise with your time and effort will take you much farther along the path to becoming an accomplished wildlife photographer, and this is what I want to address next. I have used Clay’s technique to locate any number of small, and often well-camouflaged creatures. Despite the fact that unexpected, yet wonderful photographic opportunities sometimes appear in front of you, becoming an accomplished animal photographer requires much more than just swimming around with a camera and capturing images of any subject you happen to encounter. Initially, this swim-and-shoot method pleases us, but many photographers soon want to work with particular subjects or capture specific behaviors. Photography becomes a completely different endeavor when you have photographic objectives in mind before you assemble your camera system. Back in the 1980s I was working on a guide to Caribbean marine life with my partner Clay Wiseman. 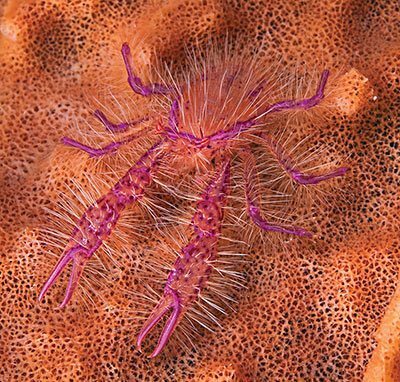 Clay was both a biologist and a live-aboard boat captain at the time, and his photographic library included a number of terrific images of smaller creatures that I knew existed, but that I had never seen. During one of my trips to visit Clay I asked him about his ability to find and photograph some of those subjects. So, he took me on a dive, and I watched him get his eyes as low as possible to the sand while moving ever so slowly as he looked for anything that appeared to be ever-so-slightly out of place. Find that something, and he would take a closer look. 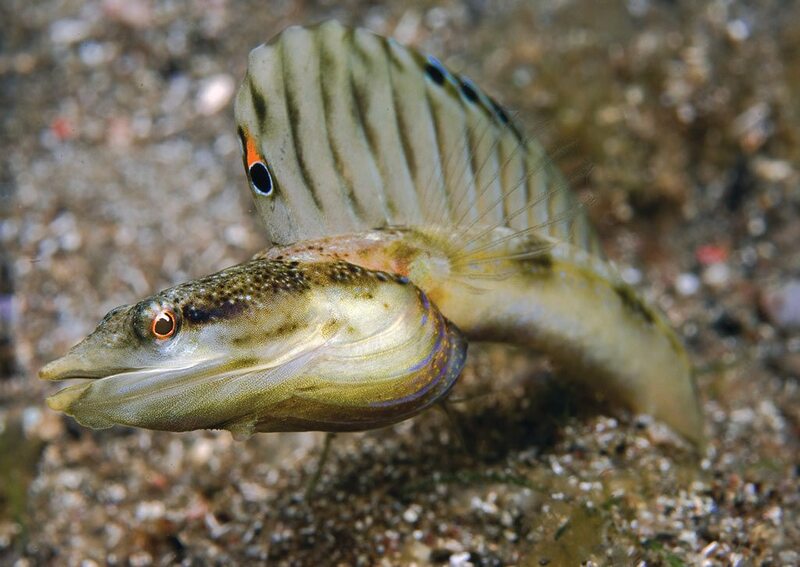 On that dive we were able to find a displaying male pikeblenny, a subject I had only seen in other people’s pictures. Since that dive, I have used Clay’s technique to locate any number of small, well-camouflaged creatures. Learn about your subjects, including where and how to spot them. And take advantage of knowledgeable local guides. You’ll never get the shot of the pikeblenny if you can’t find it. Learn as much as you can about potential subjects. Quite often a lot of that knowledge comes from researchers and local dive guides. While we don’t always have easy access to scientists, almost all divers can take advantage of locals who are willing to share their knowledge. In those cases all we have to do is ask and listen. Here are a few comments about photographing big animals. First and foremost, don’t ever take big animals for granted. Second, if bait is used to attract your subject, always know where the bait is, where you are in relation to the bait and which way any current is causing the bait to drift. It’s never a good idea to position yourself in the chum line. In strict photographic terms, think hard about how close you are really likely to get to a big animal when you select your lens. It’s a real buzzkill when big animals appear rather small in your frame. 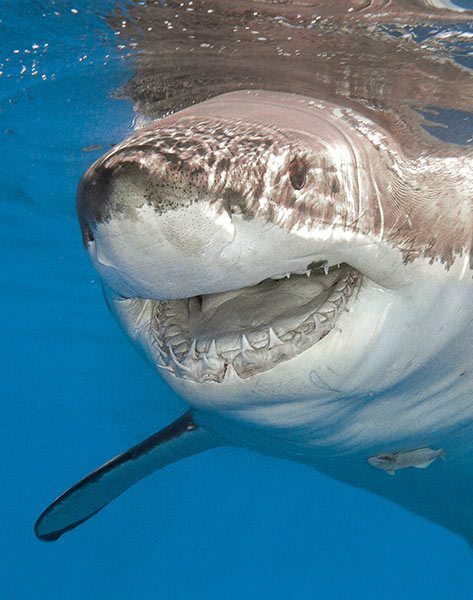 Too many photographers fall into the trap of grabbing the widest lens in their arsenal, and that can result in animals as dramatic as great white sharks and bull sharks appearing to be disappointingly small in your images. And know this: Just like everyone else who loves to try to photograph big animals, you are much more likely not to get the exact images you want than you are to “nail it” exactly as you envisioned your image before your dive. At that point, if you really want to create the image you had in mind, it is back to the “Three P’s”: passion, persistence and patience. 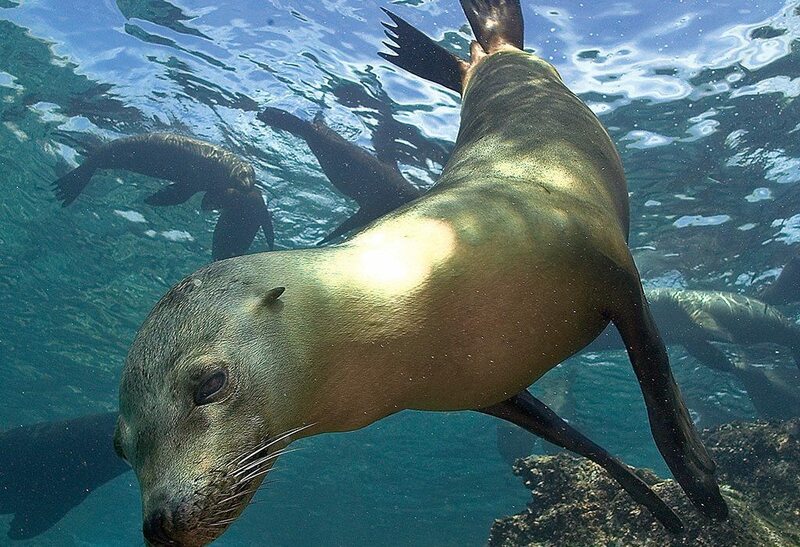 They truly are integral parts of becoming a good underwater wildlife photographer. Carry on.